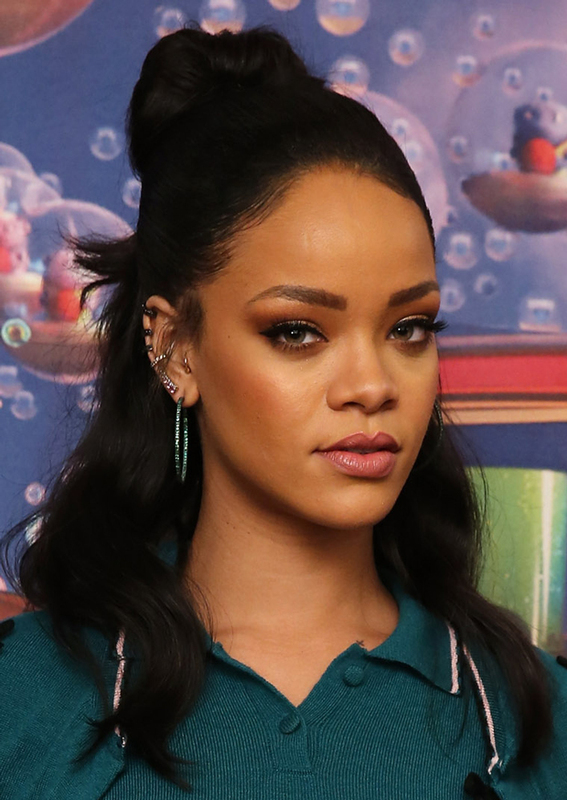 Rihanna is not one to shy away from statement-making fashion and beauty choices — and we applaud her for it. However, sometimes it’s refreshing to see our favorite ladies go for a make-under in the beauty department (see: Lorde at Paris Fashion Week). The new face of Dior was in New York City over the weekend for the premiere of her new animated film Home and stunned with her subdued makeup and flirty half-up, half-down hairstyle. There is something effortlessly elegant about the 27-year-old’s hair styled in soft waves and a half-up pony that was twisted into a mini chignon — but the beauty look was really all about her makeup. The focus of the look is pink lips and natural, full brows. To get the look, apply a light glow-giving foundation and softly contour the cheekbones and jawline. Get RiRi’s healthy flush by using a blush that best suits your skin tone and do the same for lips with a pinkish lip gloss or lipstick. Right now, we love the new Anastasia Beverly Hills Liquid Lipstick in Sweet Talker ($20) — the pigment is high, application is a total breeze and color stays put for hours. Finish the look by filling in brows ever so lightly with a few strokes of Hourglass Arch Brow Sculpting Pencil ($32) where needed and define eyes with a single swipe of liquid liner.